We’re always looking for interesting, cool haunts to head to before or after shows. 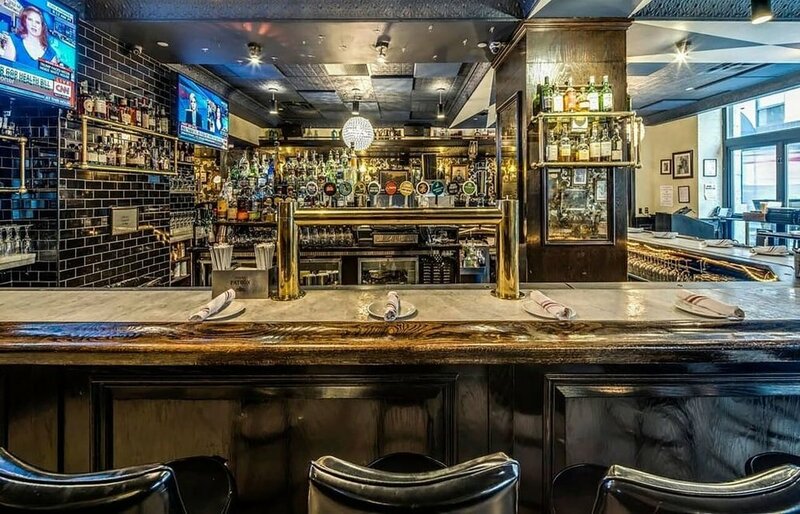 You know the kind of place: bars and restaurants that have a low-key glam vibe, but remind you that you’re seeing theatre in the “The Greatest City of the World.” (Thanks, LMM.) Looking for suggestions of where to head before or after a Broadway show? Here are five recommendations for venues near Broadway great for before or after a show. Looking for a great place to impress out-of-town guests? Look no further than Refinery Rooftop. With iconic views of the Empire State Building, it’s a great place to bring friends for that quintessential New York City night. The Rooftop’s signature cocktail list is full of sure winners. As lovers of all things bourbon, the menu features four speciality Old Fashioned’s inspired by Academy Award-winning films. Our pick? The Sky “Fall” which features apple and baking spices. Yum. Get your farm-to-table fix at Trademark Taste + Grind, which features the wares of local farms and farmers in its American regional cuisine. Head to the bar in the back of the restaurant for a cozy booth vibe. Check out the dessert menu for a slew of decadent treats large enough for sharing. The Big Bananas includes a portion big enough for two (with toasted marshmallow fluff!) And the Cookies & (Boozy) Milk For Two includes a bottle of their Cereal Milk White Russian. Yum. If you’re thinking brunch before a matinee, check out The Wilson. Although it’s got a fast-paced neighborhood vibe, it’ll be sure to make everyone in your party happy. For those who are on a health kick, the Acai Smoothie is sure to please, and for those who are looking for something more indulgent, the Malted Waffle or Rum Raisin Challah French Toast will be perfect. For a post-show cocktail, try their signature Gin and Tonic, which features Beefeater gin with cherry blossom tonic, lemon and thyme. Located in Midtown’s Refinery Hotel, Parker & Quinn is filled with design details that will make you want to settle into a cozy booth for hours. From the “more is better” design aesthetic of the walls to the comfortable leather booths with hand-tacked cushions, the space playful combines class with comfort expertly. Parker & Quinn’s menu truly has something for everybody. I’m a sucker for a roasted beet salad, but Parker & Quinn take it to a whole other level with the addition of apples and hazelnut-citrus dressing. Their selection of flatbreads is incredible as well, because who doesn’t love a chance to swankify pizza! Located in the lobby of the Refinery Hotel, this space is full of dark corners and comfy couches to sink into. 100 years ago, the building was used as a factory for milliners, with the ground floor acting as a combination tea room for women and restaurant for men. Today, the decor calling back to a prohibition-style speakeasy. The vibe is refined, but relaxed and even features an upright piano with live music. Winnie’s cocktail menu features a multitude of New York classics, from the Vesper Martini (which includes both vodka and gin) to a rum cocktail inspired by Chet Baker. For those who don’t have too far to travel after their drinks, check out their flights, which feature local bourbon distilleries alongside Irish whiskeys as well as some top-shelf tequilas!